In one of the first research studies focused on the impact of weight stigma in pregnant and postpartum women, a team led by a Worcester Polytechnic Institute professor found that women who experience weight stigma during pregnancy and early postpartum often show increased depressive symptoms, greater weight gain during pregnancy, and weight retention after their baby is born. During pregnancy, women endure myriad physical and psychological changes, many of which can be affected by social factors. One of these factors is weight stigma, defined as bias of discrimination toward individuals who are perceived by others to be overweight or obese. According to research by Angela C. Incollingo Rodriguez, assistant professor of psychology in the Department of Social Science and Policy Studies at WPI, pregnant women and women who are up to one year postpartum face weight stigma, which has negative effects on maternal health. "Weight stigma is a growing field of study, but very little work has focused on weight stigma in the context of pregnancy," Rodriguez says. "We found some of the first evidence that when pregnant women experience weight stigma, it might be associated with more postpartum depression and even difficulty losing their 'baby weight.'" 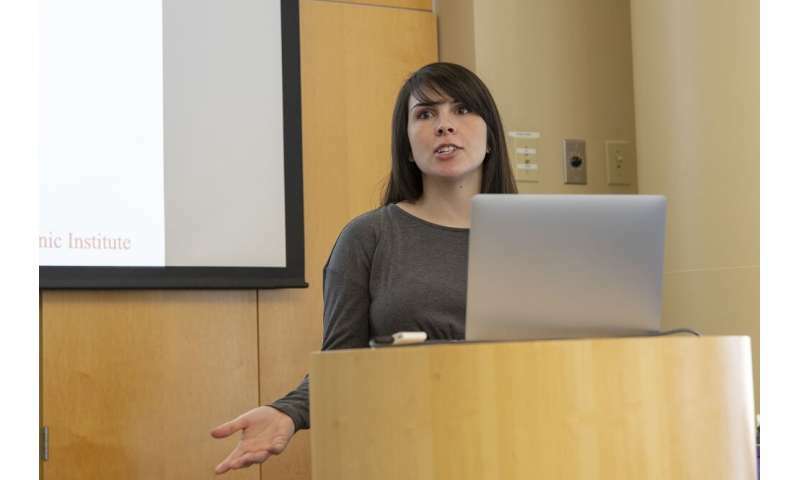 Rodriguez and her team reviewed questionnaires from 214 women, a smaller subset of a group of 2,510 women ages 18 to 40 of African American, Latina, and White descent who delivered a live infant at 20 weeks or more of gestation. The women, who were from Maryland, California, Washington, D.C., Illinois, and North Carolina, were asked to report instances of weight stigma from the previous year when they were one month postpartum. Additional data, such as symptoms of postpartum depression and weight retention, were collected from the women at one month, six months, and one year postpartum. The team, which included researchers from WPI, the University of California, Los Angeles, and Dickinson College, used data from the Community Child Health Network, a five-site research network funded by the Eunice Kennedy Shriver National Institute of Child Health and Human Development. The questionnaires used the Everyday Discrimination Scale, a standardized list of questions assessing the frequency of different types of discrimination, including being "treated with less courtesy than other people" and being "threatened or harassed." The women also were asked if they felt the stigma was targeted at their height, weight, or other factors, such as their race, accent, and nationality. The team's research, published by Health Psychology, in the article "Association of Weight Discrimination During Pregnancy and Postpartum with Maternal Postpartum Health" focused on three outcomes that might be associated with the instances of weight stigma: postpartum depressive symptoms, weight-related outcomes, and physiological activity. Their findings revealed that experiences of weight stigma were related to excess weight gain during pregnancy – 51 percent of the women in the study gained excess weight during their pregnancies. Similarly, the team found that weight stigma was associated with increased weight retention – which averaged 10 pounds at six months to one year postpartum—along with increased depressive symptoms at one year postpartum. "These findings are really troubling, especially because postpartum depression affects not only the mother's well-being, but also her child's," Rodriguez says. "These are meaningful outcomes, and we really need to be thinking about how family members, friends, doctors, and even society treat pregnant women regarding their weight, because these weight-stigmatizing experiences could have long-term deleterious consequences." By conducting one of the first studies to look at weight stigma in postpartum women, Rodriguez hopes to raise awareness of how this stigma may have negative effects on maternal health, mentally and physically. She also hopes her work will influence communities to be more mindful of how they treat pregnant women, especially regarding weight and weight gain. "Ultimately, we need more research on this topic, but I am hoping that this work sets the stage for such future research so that on a societal level, we can achieve a better understanding of the risks of weight stigma in the context of pregnancy," Rodriguez says. "If we can create a more supportive environment for pregnant and postpartum women, this could potentially have a huge benefit for both maternal and child health. The implications of that are far reaching."